You’ve been working on a team for years and were hoping that one day you’d be promoted. That day has come and your manager called you to her office, congratulated you on a job well done, and told you that you’ve been promoted to team lead. Wow! You’re on cloud nine. You’re thinking finally all the hard work paid off. You can’t believe it. You left her office pumped and motivated. You can’t wait to go tell your friends and family about it. 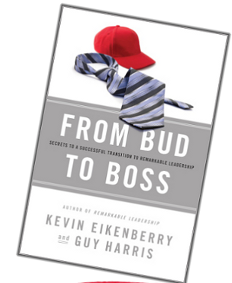 The book From Bud to Boss is like a GPS that guides you through each and every step of the way. But the readers need to have an open mind and be willing to commit to invest the time to learn. The two key ingredients you need are desire to succeed and belief that you will succeed. How I wish I had this book 18 ½ years ago. Success would have come early for me because of all the skills and knowledge that I could gain from this book. The book is like a train with many stations. Each station provides you with some information and exercises that allow you to explore and learn about yourself and others. The skills that you learn can be applied immediately at work. I call these action learning and it makes the knowledge stick better, thus lasting longer in your memory. Besides, the skills you learn will make you confident in your ability to lead your team. Bonus bytes are little pots of gold that the reader should take advantage of and explore. The book provides you with information that helps you navigate and handle situations that might arise. Learn to transition from being a doer to an influencer. Getting the job done through others versus getting the job done yourself. How give up control and learn to influence and trust others to get the job done. Understand change and how a leader can facilitate change. Understand communication and how to communicate with people with different styles. How to set goals and get the goals. This book takes the guesswork out of trying many things and failing at each one of them. You don’t have to live in the world of trial and error. But as a reader your commitment to apply and do what the book says is important. At least there is a light at the end of the tunnel. While From Bud to Boss is a great book, it can’t change things for you unless you want to give it a try. Only you can do that by applying what you learn. Go out and buy From Bud to Boss from Amazon. In closing, I highly recommend this book to anyone who was recently promoted and people who are aspiring to be promoted. This book will help you immensely in your journey toward being a successful leader. For seasoned leaders or people in middle management, this book is also valuable because it provides you with a framework to guide your newly promoted people to be good leaders of tomorrow. I liked the article about the book. The answer is yes. I’ll get you one. What do you think of the book “Nice Girls Don’t Get the Corner Office”?